Help Me, Jesus! I Have Nothing to Wear! In Help Me, Jesus! I Have Nothing To Wear! 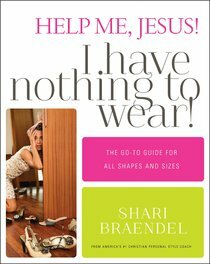 Shari Braendel teaches you how to finally love the body God gave you and how to look your best?from discovering your body shape and learning to dress it, to finding your best colors, to wearing jeans that flatter your thighs and hips, to finding the best places to shop to suit your unique personal style. Many of us are watching reality TV shows to get a clue on how to dress right and look good. We hungrily purchase fashion magazines any time the cover article has something to do with how we can hide our despised body parts. We make mad dashes to the local department store to pick up the new anti-wrinkle cream Dr. Oz promised will take ten years away from our face. We care about how we look. Why is that? Because we're women, and women love to look and feel good. God made us that way. And this is not a bad thing. In fact, it's a wonderful thing! God loves beauty. We should reflect his image by remembering that fashion meets faith the minute we decide what to wear each day. How we dress reveals to the world who we are, on the inside. This comprehensive style guide will show you how to look and feel your best, no matter what day it is or what the occasion. And it will stop you from screaming at the top of your lungs, ?Help me, Jesus! I have nothing to wear!? About "Help Me, Jesus! I Have Nothing to Wear!" Shari Braendel is a sought-after speaker for Christian women's retreats, conferences, and youth events all over the nation. A fabulous, fun, and refreshing fashionista, she regularly hosts workshops for women to help them appreciate their beauty, discover their natural assets, and learn what to wear so they can look and feel their best.